How much money do you think you could make with your party tricks? The cast of Stomp have developed a series of party tricks (and they’re great party tricks), and have put them together for our viewing pleasure. 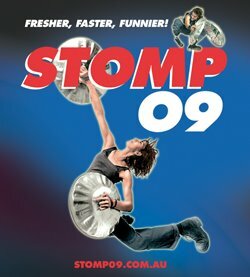 Apparently this happens every year, and the TV ad has been saying that Stomp 09 is fresher, faster and funnier, which is just as well because I got bored halfway through, and if it was any slower or less amusing I may not have sat it out. There are moments throughout that are indeed fast and funny (I’m not sure whether they’re fresh, you’ll have to ask the marketers what that means), and it was a fun night, but it left a lot to be desired. Most of the audience loved it, three or four of the thousand people there even thought it deserved a standing ovation, and the raucous applause elicited an encore better than the show itself. Some children in the audience elicited some golden responses with their laughter, and the show would be excellent for a family, if you want to blow your entire stimulus payment on it, that is. I don’t want to be mean; the cast is talented, responsive to the audience, perfectly synchronised, and very entertaining; but I just can’t help thinking that these are just glorified party tricks. They are great party tricks, they really are, but I just can’t help wondering why no one pays $80 to come and see my party tricks. Actually, no: if their party tricks are worth eighty bucks a view, mine would only be worth eighty cents, but it still makes me wonder, where’s my eighty cents? So, the next time you’re at a party and someone starts banging on a garbage bin, remember to give them their eighty cents. Apparently they’re worth it.